FEAR FACTORY - MECHANIZE LTD. EDIT. FANBOX (TOOL BOX) | Online Shop | Wizard LTD. Album: "MECHANIZE LTD. EDIT. 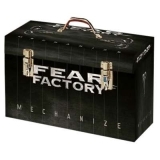 FANBOX (TOOL BOX)"
Hamburg, Germany: AFM Records today confirms February 5, 2010 as the European release date for Mechanize (US release, Feb. 9, 2010), the seventh studio album from Fear Factory. Mechanize features the highly reported reconciliation of vocalist Burton C. Bell with original guitarist Dino Cazares along with bassist Byron Stroud and journeyman drummer Gene Hoglan (Dethklok, Strapping Young Lad). The anticipated album also welcomes back keyboardist/producer Rhys Fulber (Front Line Assembly). Mechanize is a full-fisted blast of passion and innovation that sounds like the missing link between’s 1995’s groundbreaking Demanufacture and 1998’s more texturally nuanced Obsolete. Songs like “Industrial Discipline” and “Powershifter” are crushing and colossal, melding fast and precise rhythms with vocals that pinwheel from raw and scathing to hauntingly melodic while “Fear Campaign,” which features harrowing spoken word passages, quickly segues into a showcase of punishing beats, rapidfire riffs and ghostly keyboards. For the first time in years, the band’s industrial roots glimmer through its street-lethal metal, thanks in part to Fulber, who worked on Fear Factory’s popular industrial remix albums Fear is the Mindkiller and Remanufacture. While Mechanize is instantly reminiscent of Fear Factory’s most potent moments of discovery, it’s hardly a stroll down the old assembly line. Through a combination of technological advancements and experience, Fear Factory have evolved like a computer virus, constantly reconfiguring itself to maximize its destructive impact. As work began on the album in early April, Bell, who resides in Pennsylvania, admitted he initially expected the years apart would leave him feeling awkward or uncomfortable. However, when Cazares picked him up at the airport his apprehensions melted like a block of ice on a hot electric motor. “After being with him a couple hours and talking to him everything was cool,” Bell says.” Three months later the duo had a fresh batch of new songs written and a more importantly a renewed confidence in their union. In the early ‘90s, many years before Killswitch Engage and Shadows Fall started combining strangled growls with catchy vocal melodies, and Static-X and Rammstein began blending pounding staccato riffs and jackhammer beats with electronic samples, Los Angeles future-thinkers Fear Factory were reinventing both death metal and industrial rock with an arsenal of sonic styles. The band, with Bell and Cazares at its core, landed a record deal based on a self-financed recording they made with producer Ross Robinson (Slayer). They immediately entered the studio to record their first proper album, Soul of a New Machine. Released in 1992, the album nearly transformed death metal overnight with its blend of throat-abrading screams and melodic vocals, and sci-fi lyrics about a machine that was invented to control and contain mankind.